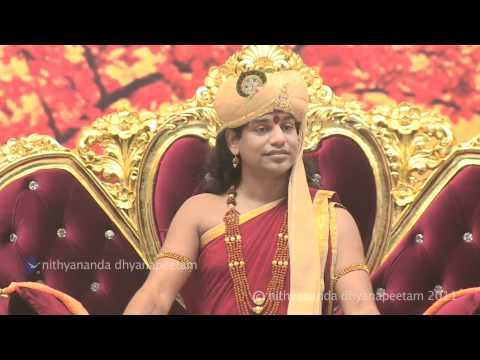 Preview the talk 'Addiction is just an escape from life' talk delivered to a live global audience by Paramahamsa Nithyananda on the Bhagavad Gita series day 19 on September 10, 2011 Now Arjuna's depression is peaking and he is becoming near-suicidal. He is terrified at the prospect of losing the war and still being alive. He tells Krishna that he would rather beg for food than kill his teachers. He feels wealth attained thus is forever stained with blood and that he does not wish to live after slaying the sons of Dritarashtra. Caught in his hypocrisy and convoluted logic, Arjuna keeps repeating the same words again and again to Krishna. The depression that he empowered by constant verbalizing is now beginning to swallow him. But fortunately for Arjuna, he is with the right consultant, the Mahapurusha. Like Arjuna, we are so lost in our convoluted logic, explains Swamiji. Caught in a deep illusion created by our logic, we try to find solutions for our hypothetical problems and in the process totally lose touch with life. The only anti-dote to this is to live in simple awareness. When in deep trouble, instead of mulling over the problem, we simply need to decide that we will be successful.